Thinking about fun projects for the Hands On activities at the Houston Center for Contemporary Craft (it’s a difficult task to try and offer projects that may be of interest to children as well as adults every month). 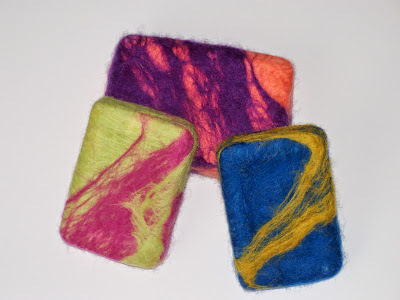 I ran across a couple of felted soap projects while browsing the internet. Looked like fun. Thought I’d try to make a couple and they turned out pretty well. This was popular with the felters a few years ago. The idea was to make them for hostess gifts. Maybe we can make it popular again. This time as gifts for ourselves. Wet felting can be a little messy but when you felt a bar of soap, you have very clean hands! Hope the group at HCCC likes my project. Pat, this looks like a fun activity.